This Sandisk Sansa Clip+ MP3 player with FM radio is ideal for all serious yet budget-conscious music fans! As well as producing high quality sound, the Sansa Clip+ has a bright screen whereit clearly displays the files you have stored on it. The easy-to-use interfacehelps you find the tracks of your choice on its 8 GB memory, and you can searchby title, album and artist. 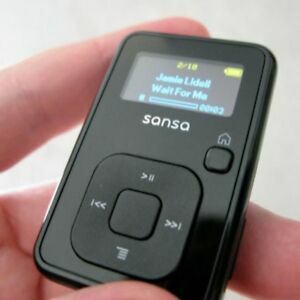 In fact, the Sansa Clip+ holds up to 2,000 MP3 files or 4,000 WMA files, and it's compatible with secureWMA, Audible, Ogg Vorbis and FLAC formats. It also handles audio books and podcasts. Plus, thanks to its FM tuner and Dictaphone mode, you can save 40 ofyour favourite radio stations or record voices. microSD and microSDHD slots formemory cards are available on the Sansa Clip+ too. The built-in clip lets you easily attach the Sansa Clip+ to your clothing. If you'relooking for a versatile portable music player, this model is for you!